We've added a new feature on the Studio Calico blog this month. It's all about spotlighting past and present kits. I chose to pull out my leftovers from Back 40 which is still available in the shop...something that doesn't happen too often. 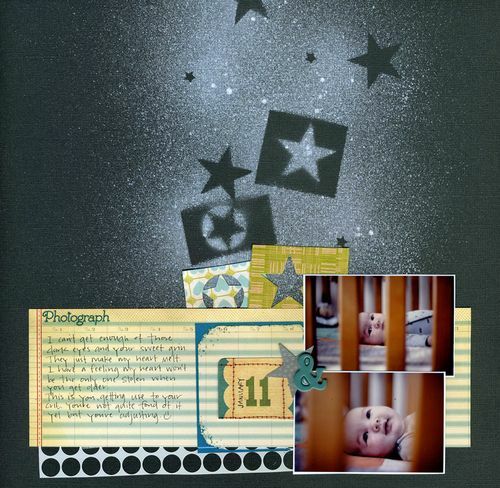 I added a little strip of my beloved circle overlay from Hambly, the photo rub ons and white Mister Huey from Studio calico....2 of my all time favorite items and a few star punches. Hope you're enjoying the weekend so far. Tyler's getting ready to visit his grandparent while I start on our taxes. Not fun but necessary. Keeping my fingers crossed for a nice return! Also still plugging away on the blog revamp. The banner is a temp for Valentines Day. Ok, the boy's ready for breakfast!